Their suffering is often worsened by feelings of torment and persecution; some patients hear voices and believe they are insulted or threatened by an evil power. 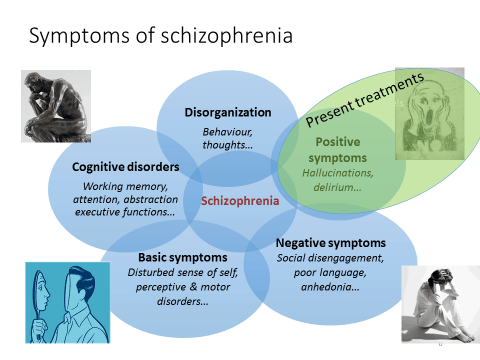 Symptoms related to schizophrenia are generally divided into so-called “positive” symptoms(hallucinations, confusion, incoherent behaviour) and “negative” symptoms (deficiencies on the level of language, communication, emotions). Patients are also affected by cognitive dysfunctions(memory, abstraction, attention, planning) and disorders on the level of perception and self-consciousness. In addition, patients suffering from schizophrenia may present non specific symptoms: anxiety, depression, aggressiveness, addiction (drugs) and suicidal tendencies among others. The appearance of these various symptoms and dysfunctions differs depending on the patients. The outbreak of the disease is due to combined factors, both genetic and linked to the environment, which lead to subtle abnormalities in the brain. Schizophrenia probably develops unnoticed from birth onwards, becomes generally apparent between 18 and 25 years of age, and often handicaps patients for the rest of their lives. To this day, no curative or preventive treatment has been developed; available medication has an effect on positive symptoms but does not improve negative symptoms, nor cognitive or basic (perceptive disorders) symptoms, which represents a major obstacle to social and professional rehabilitation. Furthermore, existing medication often causes disturbing side effects and does not guarantee a normal life. Schizophrenia is a very frequent disease as it affects 1 out of 100 persons in the world, regardless of cultures, countries or social levels. For Switzerland, this corresponds to approximately 80’000 people. 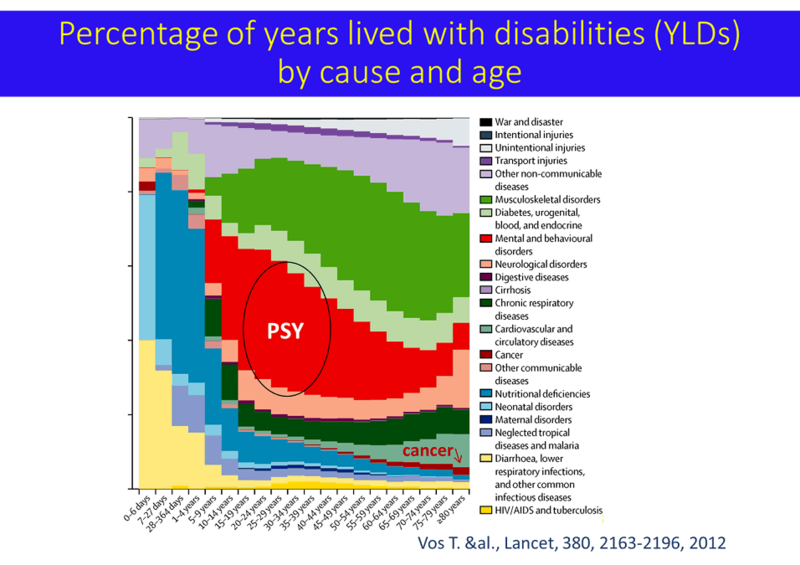 Furthermore, in terms of Years Lived with Disabilities (YLD), psychiatric disorders in young adults represent approximately 50% of all pathologies (figures published by the WHO, in red in the opposite graph). Schizophrenia not only forces great suffering on patients and their families but is also detrimental for society. Indeed, costs related to the disease (long term treatments, hospitalizations, socioprofessional rehabilitation, disability allowances, etc.) amount to approximately CHF 4 billion per year in Switzerland. Facts and figures mentioned above highlight the issues at stake in the field of research: gain a better understanding of schizophrenia in order to be able to improve treatment, and ultimatly prevent its outbreak, are objectives that are aimed at patients in the first place but also benefit their families, who are often deeply affected by the consequences of the disease, as well as society at large.